Invitado: Itai Ashlagi, Assistant Professor of Management Science and Engineering, Stanford University. 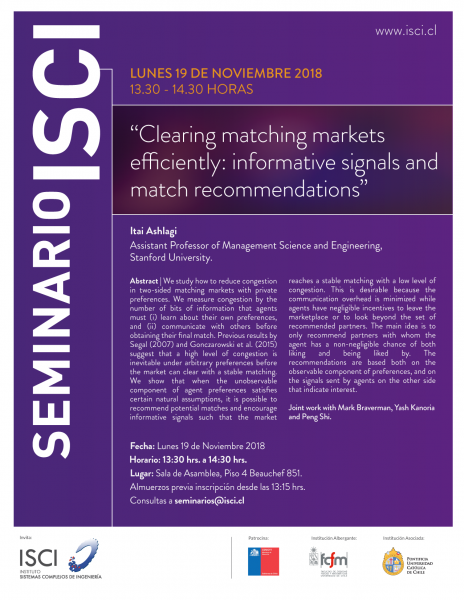 We study how to reduce congestion in two-sided matching markets with private preferences. We measure congestion by the number of bits of information that agents must (i) learn about their own preferences, and (ii) communicate with others before obtaining their final match. Previous results by Segal (2007) and Gonczarowski et al. (2015) suggest that a high level of congestion is inevitable under arbitrary preferences before the market can clear with a stable matching. We show that when the unobservable component of agent preferences satisfies certain natural assumptions, it is possible to recommend potential matches and encourage informative signals such that the market reaches a stable matching with a low level of congestion. This is desirable because the communication overhead is minimized while agents have negligible incentives to leave the marketplace or to look beyond the set of recommended partners. The main idea is to only recommend partners with whom the agent has a non-negligible chance of both liking and being liked by. The recommendations are based both on the observable component of preferences, and on the signals sent by agents on the other side that indicate interest.